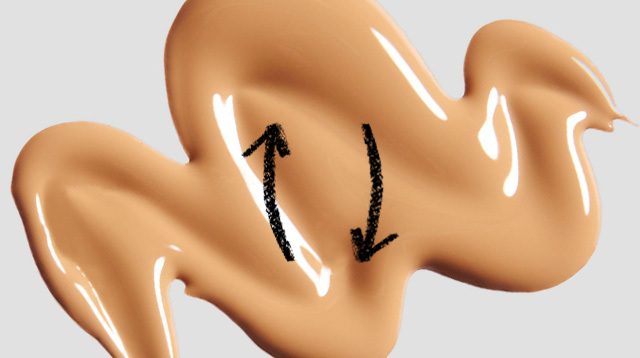 Should You Apply Your Foundation Upwards Or Downwards? When we first started dabbling with foundation, we were immediately taught to apply it with a brush using downward strokes. The reason behind it was simple: facial hair grows downwards, so to keep foundation as natural-looking and as seamless as possible, apply it in the direction of hair growth. Allure reported that Kim Kardashian’s makeup artist, Hrush Achemyan, also applies highlighter using downward strokes to conceal pores, not enhance them. Still, some people argue that the correct way to do it is by using your foundation brush upwards to prevent sagging and the formation of premature wrinkles. Don’t worry, we’re just as confused as you are. So we asked a pro. “It actually depends from person to person,” says MAC Affiliate Artist Anthea Bueno. Anthea explains that whenever she has a client who has more peach fuzz than usual, she’ll apply foundation using downward strokes. “Sometimes, I also apply foundation in a circular motion, because buffing the foundation into the skin makes it look more natural. For me, it doesn’t really matter in which direction you apply your foundation, as long as it is blended out seamlessly,” she says.